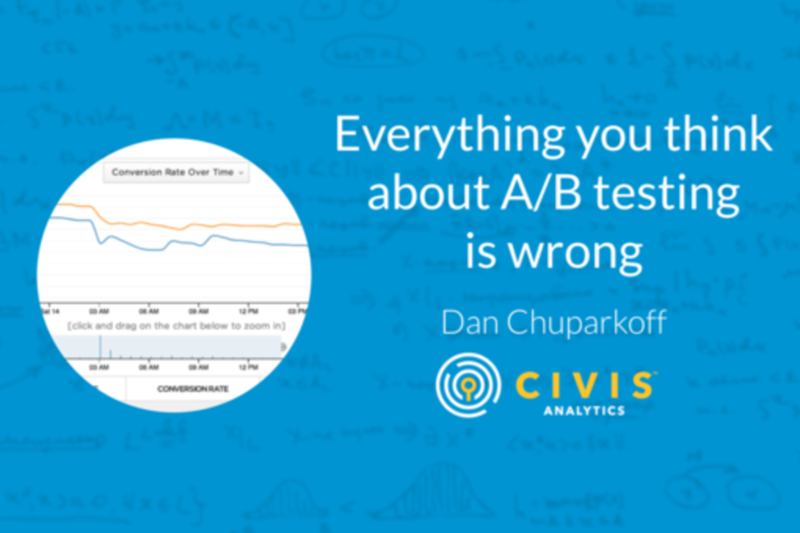 Everything you've learned about A/B Testing is based on the fundamentally flawed belief that there's one right answer. But the era of mass-market, one-right-answers is over. A/B Testing is our most valuable tool in the battle to create a more engaging web. But our strategy is broken. Don't worry, we can gain a better understanding of our users with a little data science. And we can reinvent A/B Testing... I will show you how. At Civis Analytics, we specialize in Data Science. From here, we can clearly see that all people are not the same. So why are A/B Tests designed to search for a single solution? In this session I'll show you where A/B Testing is headed next. See you in Austin! Product manager, growth-hacker, & innovative software development leader at Civis Analytics in Chicago. I am a software-delivery geek, keynote-speaker, collaboration master, agile project manager, product planning, growth-hacking, technology strategist, digital implementation guy, and futurist. I help software teams change the world. I have passionately led software product management teams, product development teams, and product growth teams for some of the world's most ubiquitous software. When you log bugs in JIRA, the world's most powerful issue tracker, check out at the grocery store, search for a job on the internet, or play interactive promotions like McDonald’s Monopoly, you’re probably using software that I helped make for you. My newest adventure is with Civis Analytics helping to democratize data science so that teams can make great, data-driven decisions easily. In my spare time, I speak at conferences on Data Science, Agile, DevOps, Growth Hacking, and Software Delivery. This is my third time as a speaker at South by Southwest (SXSW). Additionally, I am working on writing a book on emerging technologies and their impact on work.